Amazon's got the deal and it's a good one! I've been waiting for this to go on sale. As much as I love the shuttle, I was not a fan of the changes they made to make it a playset (such as non-retractable landing gear). That being said, 35 bucks with free shipping is hard to beat and I snagged one quick. Unfortunately, this is the first Star Wars toy I've bought in months now - and unless those Republic Artillery cannons finally appear (never seen one in the wild - though Amazon has them for 30 bucks) it's likely to be the last. I couldn't even bring myself to buy the new Target Tauntaun. Edited by Dake, 29 March 2018 - 12:28 PM. I did find the new Walmart pair of mini-rigs yesterday, which was a surprise. Didn't even remember that they were coming out, much less that they'd been released. Spotted the Vintage wave with the SDCC guys, too. I saw the artillery cannon once, but it was at TRU and I held off to find it cheaper elsewhere. MORE FOOL I.
I'm convinced it has to show up eventually. I think it's in the case with the Mandalorian Gunship so... we'll see I guess. Edited by Dake, 06 December 2011 - 01:20 PM. I believe both the Gunship and the Canon will ship into the new year. 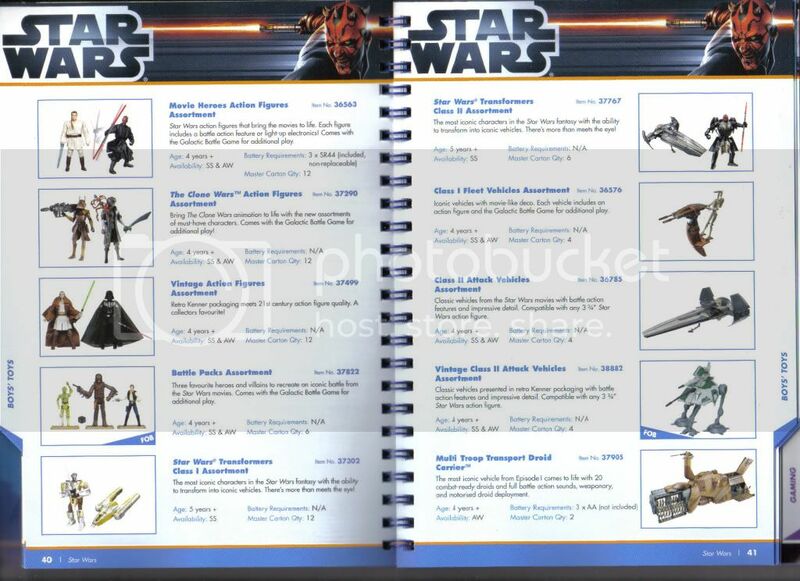 I may need some help finding the Y-Wing Scout minirig? It disappeared fast, and isn't scheduled to ship again. Edited by Nanite, 06 December 2011 - 01:30 PM. About Taun-Tauns: the set with Han and a Rebel trooper is a better deal than the standalone Taun-Taun. Yes it is. But sadly, some are compelled to get both Han's and Luke's. I've seen it once only and snagged it then. Maybe they'll show up in greater numbers as old stock is cleared out too. Looks like the UK Toy Fair spilled the beans on Hasbro's next big vehicle - the MTT. This is quite the gamble on their part. I know there has been a collector clamor for this ever since TPM first came out, but it still seems surprising they went for it. I have to say I doubt I'll spring full price for it myself. It's neat, but not that neat... I'm more excited for the Avengers helicarrier honestly. it has twenty droids in it?! Twenty droids?! I'm... sorely tempted. Supposedly it's a bait and switch. Only four are regular droids and the remaining sixteen are molded in the storage mode. This does possibly explain why the new sculpt, collapsible battle droids are significantly shorter though. Just think, you'll be able to fill it up with regular droids for only an additional 150 bucks or so! Edited by Dake, 24 January 2012 - 11:02 PM. Edited by Esser-Z, 24 January 2012 - 11:02 PM. Supposedly it's a bait and switch. Only four are regular droids and the remaining sixteen are molded in the storage mold. Oh to hell with that then. I'd be seriously tempted to buy it if does come with 20 droid figures. Instant army my other toys could fight, with vehicle! That just tickles the kid in me. If it doesn't, though, I'll definitely not be interested. Edited by Esser-Z, 24 January 2012 - 11:04 PM. Yeah, I'd be more surprised if it did come with all those figs though. I assume this is going to be a hundred bucks at least already, and that many figures would easily add another fifty to seventy five or so. The shame is, it's not like a Rebel Transport or something that can double as a carrying case. This can only store a bunch of one type of figure. Yakface.com is reporting this will likely be a Target Exclusive, DPCI is 087-06-0846 and a price of 129.99. Well, at least we know it will go on sale - if this was a TRU exclusive it would have cost thirty dollars more AND been on shelves for five years. I kinda want that MTT, I always thought was such a cool looking vehicle. I have no idea who Shae Vizla is (well, other than deducing she's an ancestor of the Pre Vizla), but that proto they showed of her looks pretty cool. I don't think I need another Nikto or Force Unleashed guy though. Do you think Hasbro will ever make a new X-Wing toy (to scale with the figures, of course)? How many more years can they milk that old mold?